You can dance if you want to, but leave teenaged Mike Huckabee behind. Because according to evangelical-oriented columns he wrote in the 70s’, Huckabee didn’t dance, and if he didn’t dance, then he’s no friend of mine. 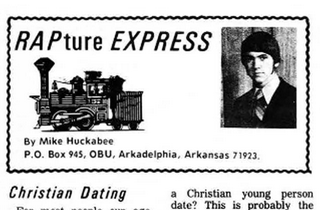 As a recent high school graduate on his way to Ouachita Baptist College, a young Huckabee wrote a column for a local Baptist newspaper in Arkansas called “The RAPture Express.” In these youth-oriented columns, unearthed by BuzzFeed, young Huckabee expounded on evangelical concepts as related to the modern day, such as soap operas (“pure trash” consumed by liberals), dating (only date Christians and not “lost people”), and a recent mass murder in Houston (caused by a lack of evangelizing, according to Huckabee). I personally don’t see that much arong with dances, but at the same time, I can’t find a whole lot of good with them either. I strongly recommend that Christian teens stay away from dancing, mainly because some people would just not be able to respect a person who attended dances. It sure won’t help your Christian life, and the chance of it being affected at all isn’t worth the little bit of pleasure that you might find at a dance. If the person you date won’t respect that opinion in you, then you shouldn’t be dating that person anyway. If your dating partner digs dancing more than he digs you, you haven’t got much of a date. In high school, I was a debator, and know when a person has had a chance to examine all the issues on both sides of the question, the decision that is made concerning the question is a lot more stable and objective than if a person believes something just because someone else believes that way. I don’t want other young people to stay away from dances just because I do. I had rather them look at all the facts concerning dancing and then on their own decide that dancing is not for the Christian. These columns go a long way towards explaining Huckabee’s aversion to Beyoncé and ballet.